In the many cookbooks published by Bay Area Junior Leagues, there is one recipe that pops up more frequently than any other: Steamed Persimmon Pudding. Persimmon pudding is the California equivalent of the traditional English Christmas pudding (known in Yuletide literature and song as “plum pudding” or "figgy pudding"), a dense cake made of dried fruit. The persimmon version is not only more subtle and delicious—the pumpkin-colored fruit is naturally both sweet and spicy—but the dessert is a native American dish. Captain John Smith wrote in 1607 of his discovery of the pleasures of the American persimmon, "If it is not ripe, it will drive a man's mouth awrie with much torment, but when it is ripe, it is as delicious as the apricot." 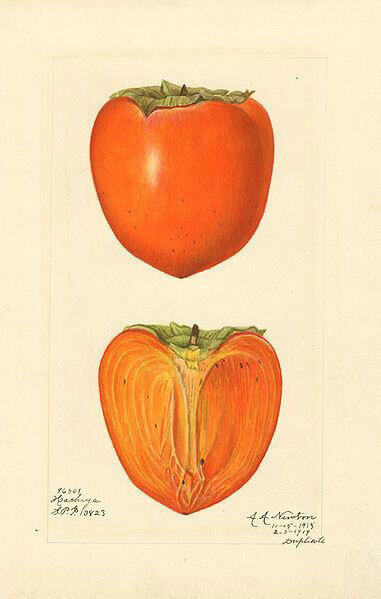 Persimmon grows well in temperate climates and thrived when it was introduced to California in the 1800s. Other regions have white snowfall to indicate winter, but in California we know the holiday season has arrived when the persimmon trees are heavy with red-orange pointed globes. In our family, Christmas dinner was always capped with persimmon pudding, a California tradition. Every recipe hunter knows that some of the most idiosyncratically American dishes can be found in community cookbooks, like those published by the Junior League. Though the older Junior League editions are out-of-print, publications from the 1970s and ‘80s still circulate, and can usually be found for a few dollars. The Junior League cookbooks from the South often include recipes for five kinds of chow-chow relish, and desserts so sweet the imagined sugar high is dizzying. The Northeast versions feature clam delicacies and intriguing uses for smashed soda crackers. Many of the recipes call for so many canned ingredients they read as retro novelties. In terms of culinary excellence, neither competes with a single chapter in the Bay Area Junior League cookbooks. San Francisco A La Carte from the San Francisco Junior League (1979), California Fresh by the Oakland East Bay Junior League (1985), and the Private Collection volumes from the Palo Alto Junior League (1980, 1984) are among the most frequently used cookbooks in my collection. The recipes are elegant but casual, often including a few surprising ingredients—the best indicator of a smart and memorable recipe. The books are filled with fresh ingredients—citrus, herbs, and ethnic ingredients unusual for the era, like “Chinese parsley” (cilantro), fresh jalapenos, and even Japanese mirin. Predictably, there are many recipes for local delicacies like crab, artichokes, and asparagus (including a perfect asparagus soup with ground coriander, lemon juice, and white pepper). But it’s citrus that rules this cuisine. California Orange Soup, for instance, is a cold soup of orange and lemon juices with cinnamon, peaches, and Cointreau. A few pages away are recipes for rice pilaf with lemon juice and brown butter, a delicious lime mousse, and a barely-sweet orange omelet, recommended for midnight snacks. California Fresh’s terrific marinade for grilled fish is equal parts orange, lemon, and lime juice, with cilantro, garlic, and bay leaf. What do these cookbooks tell us about the history of Bay Area cooking—not the cuisine of the famous restaurants, but of the home? The following recipe for persimmon pudding uses Hachiya persimmons rather than the Fuyu type, which weren’t commonly available when these books were published. To make persimmon puree, cut the fruit in half and scoop out the soft flesh. Puree in a food processor or blender in batches until smooth. Though the recipe calls for a traditional butter-based glaze, this particular pudding is perhaps better with brandy-flavored, lightly sweetened whipped cream. 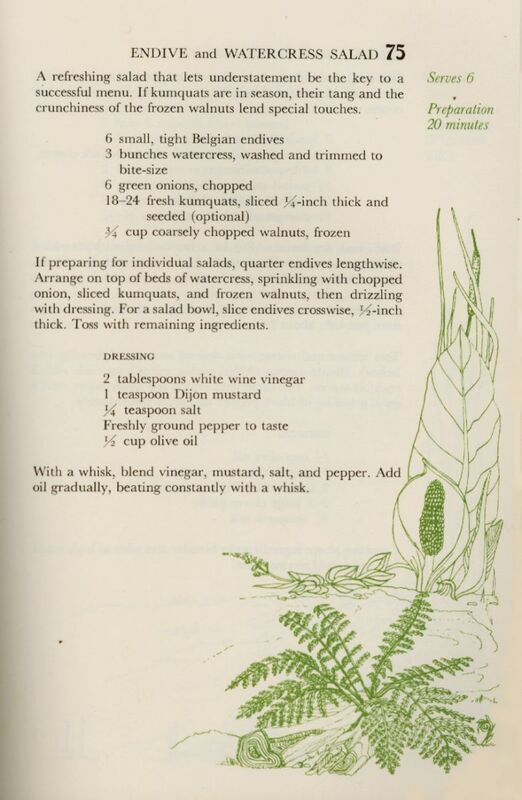 From California Fresh Cookbook (Junior League of Oakland East Bay, 1985). Serves 10 to 12. Available in fall and winter, persimmons lend festive color to holiday tables. Their color develops before the fruit is fully ripe, when it still has an unpleasant puckery tartness. If allowed to reach the consistency of a liquid-filled balloon, its sweet spicy flavor is superb. Butter a 6-cup lidded tube mold or use a similar capacity metal mold that can be covered tightly with foil. * In a small bowl, blend persimmon puree with baking soda and set aside. With an electric mixer, cream butter and sugar; beat in egg, persimmon puree, and brandy. In a separate bowl, stir together flour, baking powder, and spices. Add to creamed mixture, blend well, then stir in almonds and grated peels. Pour into prepared mold. Cover and set mold on rack in Dutch oven. Add 2 inches of hot water to the Dutch oven. Cover the Dutch oven tightly and steam the pudding by boiling the water gently 50 to 60 minutes, adding hot water as necessary to maintain water level, until a long cake tester inserted in the center comes out clean. Cool completely in the mold. To serve, unmold and cut in slices. Accompany with Walnut-Brandy Sauce. In a 1-quart saucepan, combine brown sugar, butter, whipping cream, and corn syrup and bring to a boil over medium heat, stirring constantly. Reduce heat to low. Cook, stirring occasionally, for 5 minutes. Stir in nuts and brandy and simmer 1 minute. Sauce will be thin. 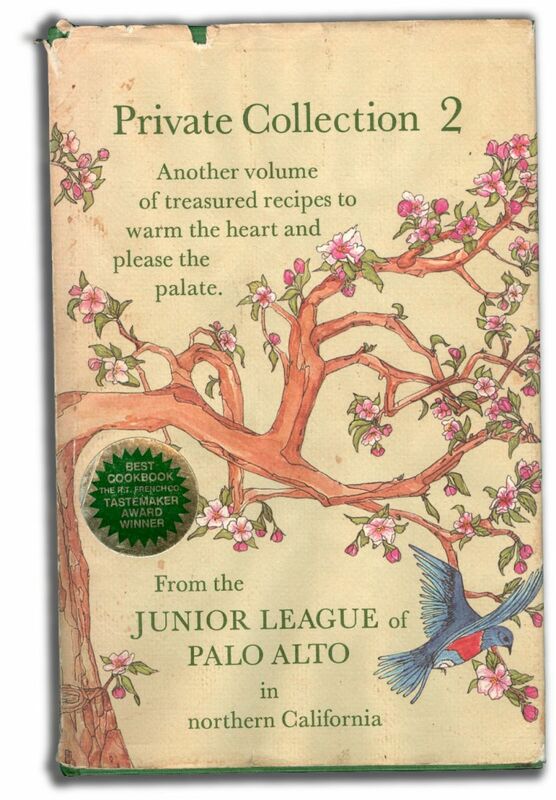 Recipe from Private Collection 2: Recipes from the Junior League of Palo Alto (Cachepot, 1984).